Preheat the oven to 180C/350F/Gas 5. Line a large baking tray with a silicone baking mat. Season the lamb neck fillets all over with salt and freshly ground black pepper. Heat two tablespoons of the oil in a non-stick frying pan over a medium heat. Add the lamb neck fillets and fry for 1-2 minutes, turning regularly, until browned on all sides. Transfer the meat to a plate and set aside. Add two more tablespoons of olive oil to the pan, add the onion and garlic and fry, stirring well, for 4-5 minutes, or until softened. Set aside to cool. Using your hands, mix together the lamb mince, puréed chipotle chillies, oregano and smoked paprika in a large bowl until well combined. Season, to taste, well with salt and freshly ground black pepper. When the onion and garlic mixture has cooled, work it into the lamb mince mixture using your hands, then divide the mixture into four and roll into patties. Working quickly, lay one sheet of filo pastry out onto a lightly floured work surface, with the shortest edge facing you. Brush all over with a little melted butter, then place another sheet of filo pastry on top and brush all over with more butter. Place one of the roasted pepper quarters 5cm/2in from the bottom of the filo pastry sheets. Place one of the patties on top of the pepper and a seared lamb neck fillet on top of that. Fold the long edges of the filo pastry over the filling, brushing the non-buttered sides with melted butter. Fold the short edges over the filling, pressing down to seal and form a parcel. Transfer the parcel to the prepared baking sheet. 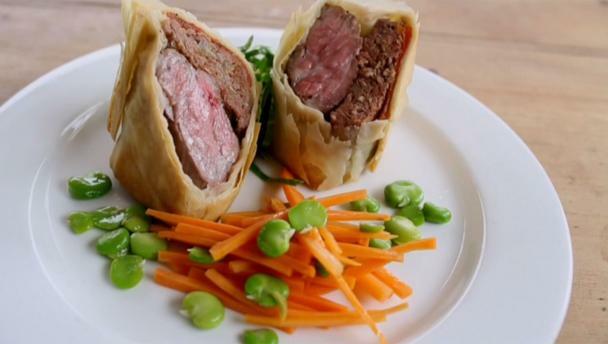 Repeat the process with the remaining filo pastry, melted butter, roasted peppers, lamb patties and lamb fillets to create four parcels. Bake the lamb parcels in the oven for 20 minutes, or until the pastry is crisp and golden-brown. Remove from the oven, cover the tray with aluminium foil and set aside to rest for 5-10 minutes. To serve, place one parcel into the centre of each of four serving plates. Serve with seasonal vegetables such as minted garden peas and steamed asparagus.